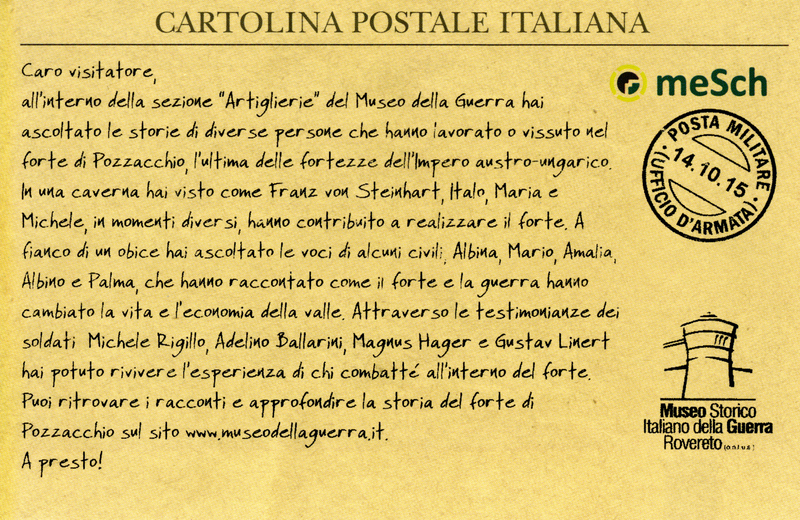 The Museo Storico Italiano della Guerra in Rovereto, Italy (http://www.museodellaguerra.it), is the Italian national museum of war and covers, among many others, the years the First World War. Beyond a collection of artefacts displayed in cases within the rooms of an historical castle, the museum provides interpretations for the remains of fortifications, trenches and refuges built at the outbreak of and during WWI in what is now the Italian Alps and in 1913 was the Austro-Hungarian Empire. The remains in the mountains are open air and the museum organizes guided visits with groups. Part of the museum’s mission is to provide interpretations that provoke visitors to reflect on the effects WWI had on the civilians and the landscape of the region, and more broadly the effect any war conflict has on people’s life and the society overall. The intent to provoke self-reflection is achieved by this installation through multiple and contrasting stories; the visitors then create their own meanings and interpretations. The aim of the interactive exhibition was to complement artefacts and factual information on display (in the form of captions, panels and photos) with personal stories of soldiers and officials as well as that of locals before, during and after the war. Digital media was used to tell the stories in a deeply personal way (first person recounting) and create an evocative experience that engaged visitors emotionally. Finally we wanted to give a personalised souvenir at the end of the visit to access content online and maintain a long-term connection visitor-museum. 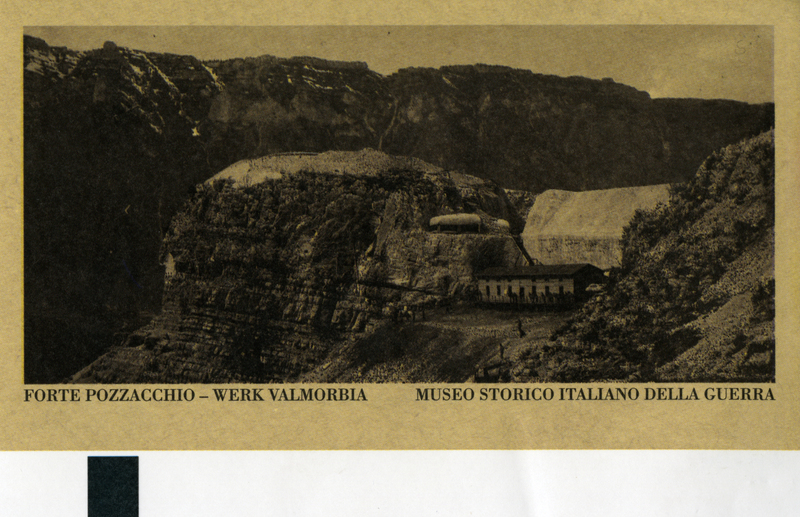 The exhibition “Voices from the past in fort Pozzacchio” revolves around the stories of people who worked or fought in the fort and whose lives had been somehow influenced by the constant presence of the fort. (Information, in Italian, on Fort Pozzacchio can be found at http://www.fortepozzacchio.it). The fort is unique: built in 1912 it is a network of caverns and passages dug entirely into the mountain over three floors. 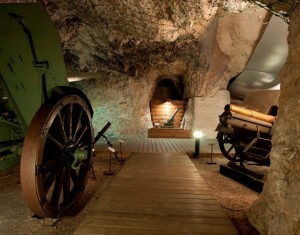 The installation is placed in the Artillery section of the museum, located in an air-raid shelter from the Second World War dug in the rock under the castle: the site is an ideal location for an exhibition focused on a fort entirely dug into the rock, as the internal physical environment is very similar (dark, humid and cold caverns). 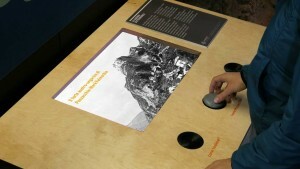 By means of four interactive stations placed alongside the museum tour, the visitor is given the opportunity to listen to the voices of various people. The stories are drawn from the museum archives, specifically from diaries or memories written during wartime or from oral witnesses’ accounts collected by the museum over time. The stations are designed as “counters” as to invite visitors to take the best position for viewing the digital content; on the top a line of shallow indentations match the shape of the activating object (the “pebble”) the visitors are given at the entrance. The pebble was designed to fit the palm, to resemble a stone from the mountain, and be evocative of the fort by means of altitude lines and Pozzacchio’s logo engravings. 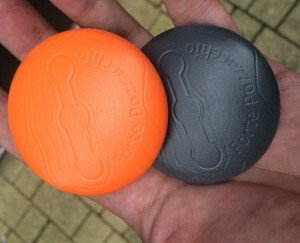 The museum requirements for the pebble were to be small, cheap, easy to use and to clean. Each of the four stations has a theme (see below); at each station the narratives are laid down in chronological order. The name and the occupation of the witness and the date the story refers to are engraved on the counter top. The evocative effect of personal narrations is amplified by the resounding of audio in the caverns, the projection of visual material over rocky walls, actors recorded as if they were speaking directly to the visitor, sounds of wind or water to trigger imagination. At the ticket office the visitor or group of visitors receive a pebble; it contains a read-write NFC tag that, when placed in one of the indentations, triggers the play of the corresponding content. When used the pebble logs some data – the station, the story, the time; this information is then used at the exit to automatically generate, by means of a checkout station managed by museum personnel, a personalized postcard that summarises the visit. At each station the visitor or group of visitors can choose which story to listen to and in which order by simply placing the pebble in one of the indentations. The first station is placed at the entrance and aims at introducing the tour: silent video clips illustrate how the interaction works; present the history of fort Pozzacchio; and show a sequence of archive photos of the construction and digging work of the road, tunnels and shelters carried out inside the mountains by the Austro-Hungarian and Italian armies. The second station tells the story of the fort itself through the voice of the chief engineer who designed it, those who built the road and the caves, the captain who lived in it and those that finally dismantled it. 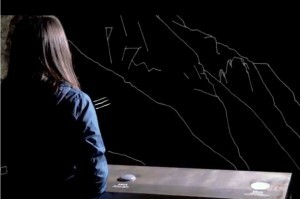 This station is located inside a short tunnel excavated in the rock: white-on-black graphic animations purposefully designed to underline each story with images are projected on a large black canvas positioned at the bottom of the cave to give the impression of the story emerging from the darkness. The large but minimal white animations that appear over the dark background of the cavern immerse the visitor in the difficult endeavour narrated. The third station is dedicated to the voices of the civilians and the impact of the fort on their lives. The stories are very different: the benefit the construction of the fort brought to the villages (e.g. work, road, water), the recruited brothers who never met again, the evacuees leaving their burning villages, and after the war the boy who died while collecting unexploded bombs and the girl who went to the fort with her goats. Evocative sounds introduce the narrations to set the scene (e.g. the clattering of a train for the young soldiers departing; a bell for shepherd daily routine; the wind blowing for refugees moving out of their houses). 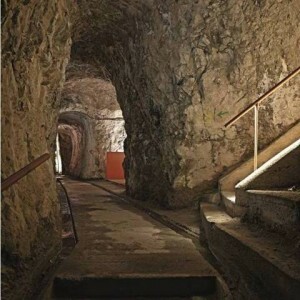 The last station is located in a secluded corner of the bottom of the cavern as to feel the space as private and intimate. Here there are four testimonies, three refer to the same war event: the failed attempt of the Italian army to conquer fort Pozzacchio, narrated by both Austro-Hungarian and Italian soldiers. Professional actors individually recited the diaries making them video portraits, confessions between the soldiers and the visitors. The recordings were done in the very same spot of the display, with original uniforms, so that the visitor is immersed in the place and the time of the narration with intensity. The display was a projection on a large white canvas as those used in paining as to reinforce the sense of a portrait talking to the visitor. At the end of the tour the visitor returns the pebble to the ticket office and receives a printed postcard personalized on the basis of the stories he or she has listened to. 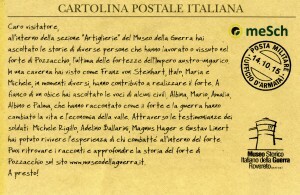 The postcard summarizes the visitor’s experience mentioning the names of the people whose stories were listened to and briefly describing the theme of the station where the narrations were located (construction of the fort, civilians and the fort, soldiers and war events). Moreover it contains a link to the museum web site where complete and unabridged texts of all the stories can be found. More info about the postcard on the post on meSch website (http://mesch-project.eu/personalisation-after-the-visit-keeping-a-personal-connection-with-the-exhibition/). With devices developed by Design Futures (Sheffield Hallam University) and Fondazione Bruno Kessler, the Museo Storico Italiano della Guerra has been able to enhance their tour for visitors by offering in-depth information on the impact of fort Pozzacchio – a fort built by Austro-Hungarians on the eve of the Great War – on the inhabitants of the region. The interactions also offer an emotional dimension that complements a more traditional display setting. The focus of the exhibition is on telling stories of inhabitants’ lives using meSch technology in order to increase the awareness of the importance of cultural heritage to small communities. The installation is part of the permanent collection. At the opening an evaluation with volunteers and independent visitors was carried out to better understand the impact of our design on the visit. Overall 143 questionnaires were collected; of those visitors 61 were observed interacting with the installations and interviewed after the visit. In particular we were interested in how the visitors perceived (or not) the presence of technology and its use; their experience of controlling the digital media via a physical object (the pebble); if the holistic approach we adopted to simultaneously design the content, the interaction and the media display for an evocative and moving experience was effective (see below), and if the personalised postcard could be a means to keep visitors connected to the museum. The observations highlighted how the setting enabled visitors to share the experience. Groups seen reading the panels as individuals then congregated at each station deciding together what to listen to. The listening was then very concentrated and intent, done in silence. The interaction was very easy and no one had any issue on how to use the pebble and activate the videos. The feedback we collected via the questionnaires during three weeks of evaluation study was very positive: visitors highly appreciated the stories and the emotional presentations (all stations scored above 85%); they stayed longer (average 15 minutes more); they appreciated the tangible interaction offered by the “pebble” (79% preferred the pebble over buttons) and felt engaged by the content prepared by the curators. The digital augmentation was acknowledged as a better way to share the experience with the visit companions, with the “pebble” used as part of the group dialogue and interaction. Positive comments were collected also on the format of the souvenir (a postcard to be kept as a memento or to be shown to others), the narrative summary (that recalls the actual experience), and as on opportunity to find more online. This project was developed as part of the EU project meSch (Material EncounterS with digital Cultural Heritage http://mesch-project.eu). 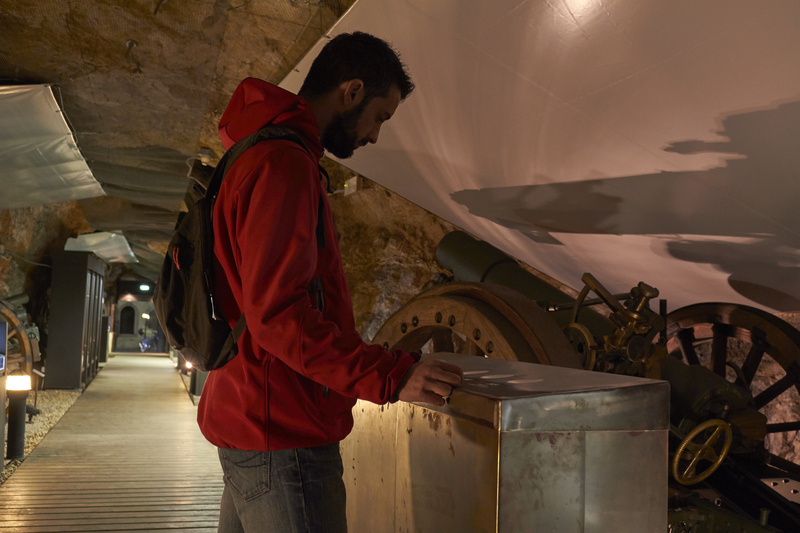 The Museo Storico Italiano della Guerra with Fondazione Bruno Kessler (Italy) and Design Futures at Sheffield Hallam University (UK) designed, developed, and installed the interactive stations. As a team they also evaluated the visitor experience. The meSch approach is grounded on principles of co-design: the participation of designers, developers and stake-holders in the process of creation and evaluation as equal partners in making and experimenting. The multidisciplinary team worked together in brainstorming and identifying a viable concept. 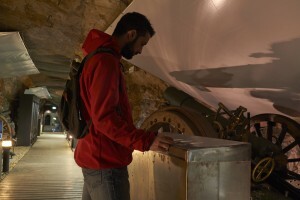 Then the work was split with the technologists focusing on the technical aspects of the installation, the logging and the automatic generation of the postcard; the designers looking into the interaction and the installations; while the museum selected and crafted the content. Periodically the team cross-checked their progress and shared key decisions. Details on the process are discussed in Petrelli et al. “Do it together: The effect of curators, designers, and technologists sharing the making of new interactive visitors’ experiences “ (http://mw2016.museumsandtheweb.com/paper/do-it-together-the-effect-of-curators-designers-and-technologists-sharing-the-making-of-new-interactive-visitors-experiences/) to be presented as full paper at MW2016.